The legal situation of gambling at online casinos in New Zealand is pretty simple – you are allowed to do it, as long as the casino is based overseas. The tricky bit is making sure you choose the right online casino, because as they have to be foreign owned, you don’t have much power to do anything if you choose a disreputable company. 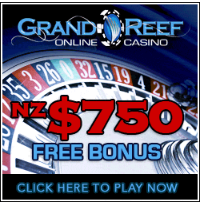 All casinos listed on this site are trustworthy and frequently used by New Zealanders. For those of you who have the time / inclination a complete copy of the Gambling Act of 2003 can be found on the government legislation site… Happy reading!